This figure debuted in the United States on The Power Of The Force card, and in Europe on the Tri-Logo card. It was never packaged on a Canadian card. Comments: The Luke Skywalker (In Battle Poncho) action figure poisoned our minds into believing the young Jedi didn?t wear his full Jedi wardrobe underneath his battle poncho. Fact of the matter is, he not only wore the tunic he was seen in before that point, he also sported a belt over the tunic -completing his Jedi transformation- on which he kept his trusty Lightsaber. To date, neither kenner or Hasbro has made a rendition of Luke wearing the complete Jedi outfit including the belt. 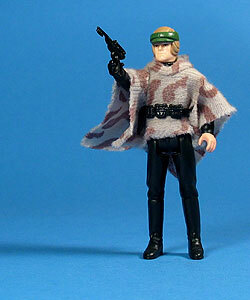 Major Variations: Though all vintage figures have minor variations, the Luke Skywalker (In Battle Poncho) action figure has no known major variations.